Dearest Dorothy, Are We There Yet? Dearest Dorothy, Are We There Yet? 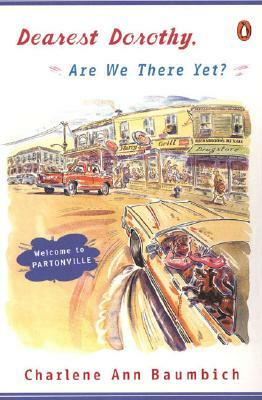 For the legions of readers who enjoy books that celebrate life's simple pleasures, eighty-seven-year-old Dorothy Jean Wetstra and her beloved farming town of Partonville, Illinois, will become instant favorites. In this hilarious, touching series, Charlene Ann Baumbich introduces readers to Dearest Dorothy, who tools around town in a 1976 Lincoln Continental nicknamed "The Tank," plays bunco regularly with her pals, and grabs a stool at Harry's counter often enough to stay on top of the latest-breaking news--which she is often creating. In the series debut, Dearest Dorothy, Are We There Yet?, Dorothy faces a decision that may change her town forever, and her gift for shaking things up comes in handy. In the second book, Dearest Dorothy, Slow Down, You're Wearing Us Out , the town's irresistible cast of characters is back in full swing as they confront some of the many surprises life sends their way. So pull up a chair and get ready for fireworks, laughter, and we'll-get-through-it-all-with-faith friendships. Title: Dearest Dorothy, Are We There Yet? Description: Advanced Uncorrected Proof copy. As new, Full refund if not satisfied.